Creation: Appeared in 1986 as an upgrade to SR 703. Ran as it does today. This is the 2nd VA 292. Comment: Since VA 263 has no exit with I-81, this is the route to use to get to it. 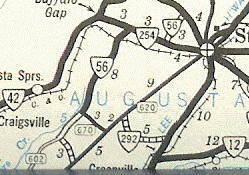 VA 292 #1: Appeared by July 1935 (route log) as a renumbering of a piece of VA 340. Ran from SR 620 (curr VA 252) Middlebrook to US 11 near Greenville. 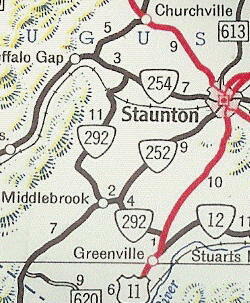 In 1945, VA 292 was extended northwest to VA 254 West View, replacing a portion of VA 56. 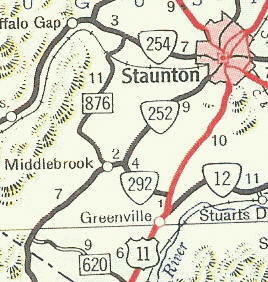 VA 292 was downgraded west of VA 252 to SR 876 in April 1949 (CTB Minutes). 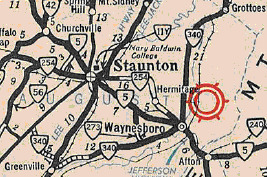 In April 1951 (CTB Minutes), the last piece of VA 292 between VA 252 and US 11 was downgraded to SR 701.